Zion Market Research has published a new report titled “Deep Learning Market by Application (Speech Recognition, Image Recognition, Data Mining, Drug Discovery, Driver Assistance, and Others), by Components (Hardware and Software), by Architecture (Recurrent Neural Networks (RNN), Convolutional Neural Networks (CNN), Deep Belief Networks (DBN), Deep Stacking Networks (DSN), and Graphical Processing Units (GRU)), and by End-use Industry (Automotive, Healthcare, Media & Entertainment, BFSI, Others): Global Industry Perspective, Comprehensive Analysis and Forecast, 2017 – 2024”. 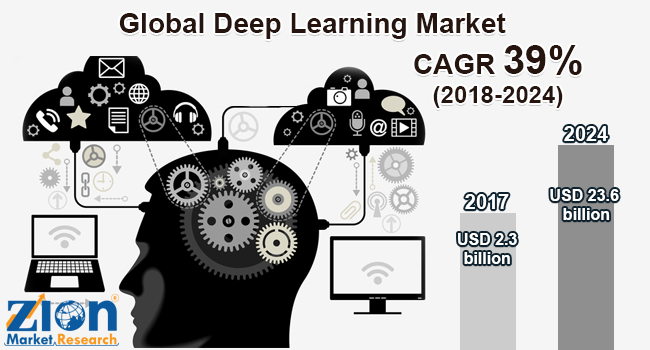 According to the report, the global deep learning market accounted for USD 2.3 billion in 2017 and is expected to reach USD 23.6 billion by 2024, growing at a CAGR of around 39% between 2018 and 2024. North America was the leading regional market with the largest share for deep learning in 2017. The U.S. is projected to lead the deep learning market during the forecast period. This growth is attributed to growing investments in Artificial Intelligence (AI). In the Asia Pacific, China is expected to be the most attractive nation for deep learning market owing to increasing research & development activities. China’s healthcare industry is also proving to be a good opportunity for startups. Key Chinese medical players have started to invest in startups with a view of using technology in dealing with hazardous diseases. A total of around USD 300 million were invested.